Gibson Guitars are still paving the way in terms of guitar technology. Enter the Dusk Tiger, [Gibson claims] simply the most astounding innovation in the history of the guitar. 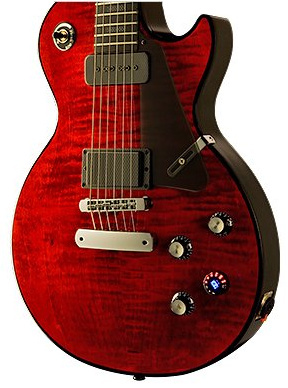 In the wake of Gibson’s groundbreaking Dark Fire, the new Dusk Tiger guitar offers an unprecedented wealth of features to expand your sonic horizons exponentially, yet it brings them to you with greatly increased levels of performance and ease of use, and all at a more affordable price. All this top is coupled with a tone-chambered back, and a unique new pickguard and control layout. Under the hood, the Gibson Dusk Tiger reveals countless new features that give it even more power, along with considerable upgrades and improvements of existing electronics and control systems, and an unlimited number of sound possibilities. 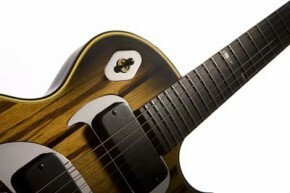 Take a sneak peak at the Gibson Dusk Tiger at Gear-Monkey message forum. 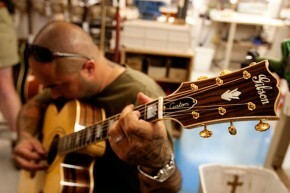 Source: gibson.com. More details and news on availability worldwide to be released by the guitar leader on Monday, November 16, 2009 – We’ll update more information as we receive it. It’s actually a visual design failure. The chrome is tacky and doesn’t even follow the guitar’s curves which is something I would never expect to see from a guitar manufacturer like Gibson or even someone with a third of their reputation. The electronics are definitely not for me. I’m sure they’re great for some people so I won’t judge that. I’m also sure it plays fine but coming from a design/manufacturing background this is a disaster just like most of the new things Gibson keeps putting out. Saying this is “arguably more refined than anything Gibson Guitars has ever produced” is an insult to the great designers that came up with the classic shapes. Just look at that chrome, it looks like it was cut by someone who has just been introduced to design/manufacturing/everything. Thanks for your insight. I’m not too fond of the Gibson Dusk Tiger either. CRAP. JUST PLAIN CRAP. DUSK TIGER, DARK FIRE (DIM BULB) ROBOTIC TUNING, BELLS AND WHISTLES. “A FOOL AND HIS MONEY………” I WOULDN’T TAKE A FREE ONE. HENRY J NEEDS A HIGH COLONIC AND A 20 MILE HIKE. IMPROVE THE QUALITY ON YOUR OVER PRICED LINEUP AND QUIT FARTING AROUND WITH WHIZ-BANG, TOM SLICK, ROBOT GUITARS. HANK, GET THE PRICE OF YOUR STANDARDS DOWN WITH YOUR STUDIO LINE AND UP TO THE QUALITY OF EPIPHONE, AND MAYBE I”LL START SHOPPING FOR GIBSONS AGAIN!